Qarabag manager Gurban Gurbanov claimed that Arsenal are too good for the Europa League after seeing his side lose 1-0 at the Emirates Stadium on Thursday. Alexandre Lacazette’s first-half strike consigned the Azerbaijani outfit to defeat in London, but Gurbanov was pleased with his team’s performance. 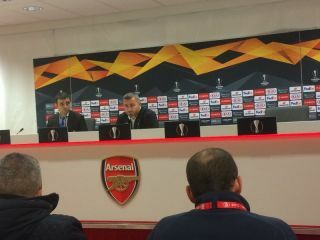 Gurbanov felt no shame in losing to a Gunners side he believes will reach the final of the Europa League this season. The Qarabag boss went on to suggest that Arsenal should not be competing in the Champions League’s sidekick tournament, hinting that he expects to see them back in the real thing soon. Arsenal last competed in the Champions League in the 2016-17 season when they bowed out at the last 16 stage for the seventh straight year. Qarabag boss Gurban Gurbanov tells post-match press conference: “I believe the team will reach the final. I would love to see Arsenal in Baku for the final. The Gunners reached the semi-finals of the Europa League last term, losing to eventual winners Atletico Madrid. Arsenal will learn more about their potential path to this season’s final on Monday when the draw is made for the round of 32 in Nyon.